Sigidi is one of five villages that have resisted the ‘Xolobeni Mining Project’ for 15 years. 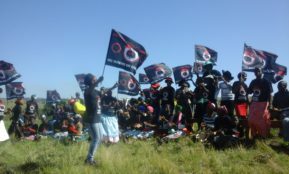 The villagers are also resisting Sanral’s N2 Toll Road through their land. It would cut the coastal villages Sigidi and Mdatya in in two, 3km from the ocean, close to the planned mining area. The coastal villages demand the N2 to be moved away from the coast. Two thousand are expected to attend Human Rights Day on Thursday in Sigidi. Most will come from the other villages and inland Amadiba, but several hundred will come from other mining affected communities and communities fighting for land or to protect land and to protect livelihoods, like the fishers of Port St John. Tuesday night we had 25 communities represented from 7 provinces announcing they will come. We demand the Right to Say No to mining and Yes to development that doesn’t destroy the land and our livelihood. We say Yes to protection of Mother Earth. Yes to food security. Yes to development of agriculture, fishing and tourism. IF WE HAVE LAND WE ARE NOT POOR! UMHLABA NGOWETHU! IMALI IYAPHELA, UMHLABA AWUPHELI! On Human Rights Day, we will celebrate the victory of the Xolobeni community in Pretoria High Court in November that Minister Mantashe and DMR have appealed. We, the affected, the Umgungundlovu community on the Wild Coast, we won the right to say No to mining. You will never take our land rights from us. Communities are coming to celebrate with us. They will demand the same right that was confirmed in court: The Right to Say NO to “development” that destroys their communities. They will join us to condemn Mr Mantashe’s campaign against this communal right; his campaign for the benefit of mining corporations and whoever they bribe in the state and in traditional leaderships. We are building a movement for the Right to Say No. No to capitalist for-profit only “development” and land grab! No to ‘business chiefs’ and the new Bantustan Laws pushed through parliament against the will of rural people. We demand that the President doesn’t sign the “TKLB”, “TLGFA Amendment Bill”, “Indigenous Knowledge Bill” and CPA Amendment Bill. Also the “Traditional Courts Bill” must be withdrawn. They are all shamefully anti-democratic. They say that 1994 was our democratic revolution. But counter revolution is on march with these laws. South Africa has rejected State Capture. South Africa must also reject Land Capture. We demand PEACE and JUSTICE in our lands. We demand a stop to the killings of community leaders who speak out in defense of the land. We demand ‘mining security’ and hit men to leave our communities alone! Our Human Rights celebration starts 9am on Thursday 21 March at Sigidi school. There will be a number of speakers from communities in defense of land and livelihood. Abongile Sipondo from the South African Human Rights Commission will attend and address the big meeting.